Stevie explores the land where it all happened! Stevies Treks is a fast-paced, fresh and fun travel-adventure series designed for preteens and teens who want to explore the world and learn about God. Stevies Trek To The Holy Land: The Miracle Of Moses  Join Stevie as he continues his trek across the land of the Bible! Have you ever wanted to climb inside a pyramid, or wondered what the top of Mt Sinai looks like? Well, Stevie is in the land of the Bible to find out! On this trek, Stevie is going to discover the many miracles God performed in the life of Moses as He continued to fulfil His promise to the descendants of Abraham. Journey through the ancient land of Egypt, float on the Nile River and discover how God used one family to keep a promise designed for the whole world! 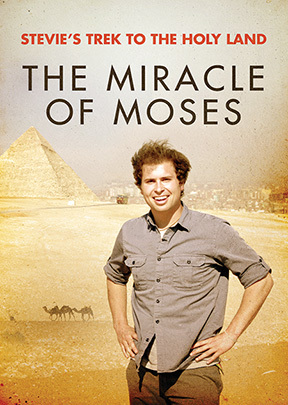 Stevie's Trek To The Holy Land: The Miracle Of Moses DVD by Vision Video was published by Vision Video in February 2014 and is our 52578th best seller. The ISBN for Stevie's Trek To The Holy Land: The Miracle Of Moses DVD is 501570D. Be the first to review Stevie's Trek To The Holy Land: The Miracle Of Moses DVD! Got a question? No problem! Just click here to ask us about Stevie's Trek To The Holy Land: The Miracle Of Moses DVD.